This is what it's all about, ladies. It's why we started this whole thing to begin with. And now our List has hit the almighty and sacred halfway point. 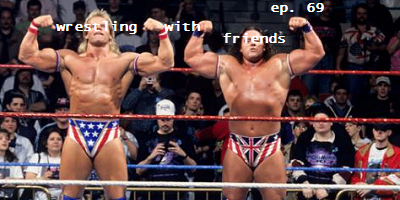 Join the Friends as they traverse nearly 2 years of talking about their personal favorite wrestlers—and then proceed to blow everything out of the water by shuffling wrestlers around, adding new ones or dropping existing ones altogether. Nobody's safe. Nothing is off-limits. Tune in to hear some of the more mind-boggling List shake-ups after 50 picks have been shared. The ceremonies don't stop there; they never do. The Friends continue to march on into that dark void called the future by starting their next half with the #50 choices. Due to some technical difficulties, the sound quality took a dive almost as bad as Mabel doing a high-risk maneuver. We hope you bear with us, as this episode was truly a treat to record and to share with all of you!